application from to nearby Bal Vikas Kendra along with all the documents. 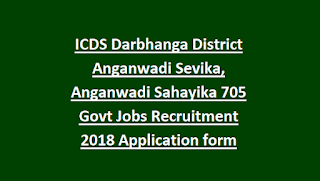 Application form submission last date is 31-10-2018 for this ICDS Darbhanga District Anganwadi Sevika/Sahayika Jobs bharti. Selection for this ICDS Darbhanga District Anganwadi jobs will be based on reservations and personal interview and certificates verification. 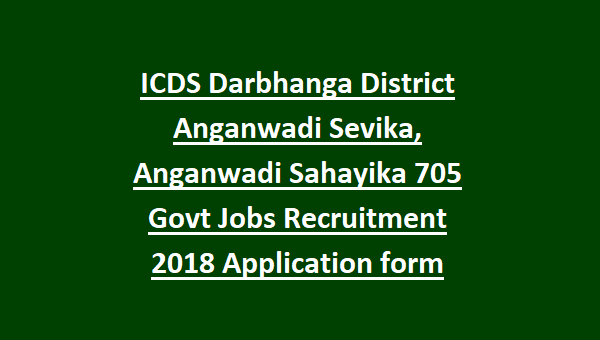 More information related to this Anganwadi Sevika, Anganwadi Sahayika jobs of ICDS Darbhanga District recruitment age limits, selection process, qualifications, application procedure details are given below. There are total 705 posts in this ICDS Darbhanga District. For ward wise vacancies refer official notification. Age limits are 18-40 years for this ICDS jobs of Darbhanga District. For Anganwadi Sevika candidate must have qualified 10th class. For Anganwadi Sahayika candidate must have passed 8th class. For Anganwadi Sevika-Candidate must be from the same ward for applying this Anganwadi jobs. Matric qualification is compulsory. More qualifications are not considered for selection procedure. It means only 10th class marks are considered for selection. Preference will be given to Widow candidates. For Anganwadi Sahayika-Candidates must be living in the same ward which she is going to apply. Preference will be given to widow women. Candidates may submit their application form to nearby Bal Vikas Kendra Office on or before 31-10-2018. Candidates apply for their staying ward only. If you are staying in one ward and applying for another ward will not be considered for selection.